Easter craft ideas for kids come in all shapes and sizes. 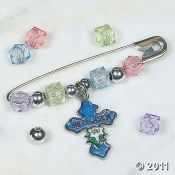 Take, for example, this Beaded Easter Inspirational Charm Pin. It's not big...but it is big on fun to make...and it's an easy craft project the kids will really enjoy making. Wait until you see all these pins when they are completed...they are going to look great! I like to have a family craft night and it's an especially fun thing to do around the holidays. You and your kids can share this fun time together crafting and making pins, decorations...all kinds of easy craft ideas. This pin would also make a fun party activity for an Easter party at home or at school. Take a look at this craft idea and many more at the Oriental Trading Company. Another way to make this holiday a wonderful experience and memory for your kids is by makeing an Easter bunny cake. When they are making these Easter Beaded Bracelets serve them a homemade Easter cake! Get fun Easter cake ideas and find some unique shaped cake pans at our Easter Cake Designs Page. Join in and write your own page! It's easy to do. How? Simply click here to return to Religious Easter Crafts For Kids.